In a historic vote Thursday, Britain decided to leave the European Union and those unhappy with the referendum's results have taken to the streets in protest. Anti-Brexit protests continued across the United Kingdom for a second day Saturday with hundreds marching in London and Scotland as the country continues to grapple with the fallout of the vote. 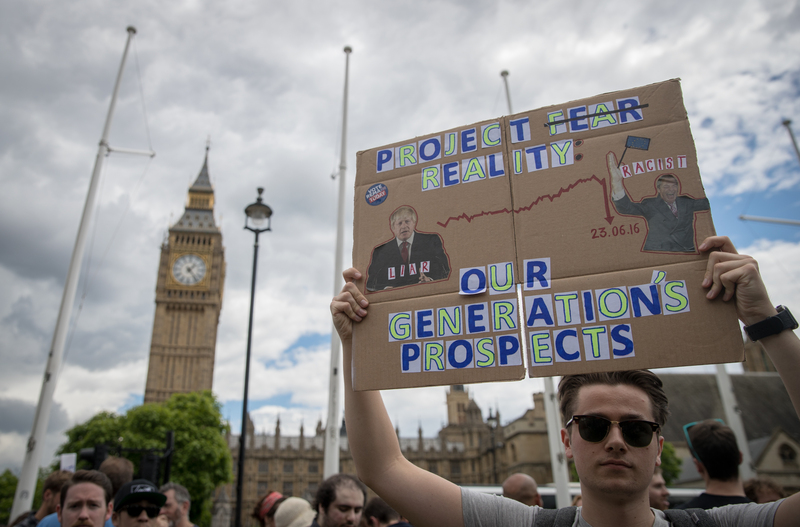 British millennials appear to be a driving force behind many anti-Brexit protests. A large majority — an estimated 75 percent — of voters age 18 to 24 reported voting in favor of remaining in the EU, according to a YouGov poll. They've since accused pensioners of stealing their future from them. But a breakdown of the votes shows young voters likely didn't show up to cast ballots in as high of numbers as older voters did. Roughly 72.2 percent of voters — the highest voter turnout in Britain since 1992 — turned up at the polls to weigh in on whether Britain should remain or leave with 51.9 percent favoring a Brexit. It was a crushing blow to many millennial voters who've not been shy about voicing their displeasure. In London, an estimated 650 demonstrators carrying colorful flares and signs reading "refugees welcome" marched over London Bridge to the Shard, the home of Rupert Murdoch's (a Brexit supporter) The Sun and Times newspapers, Friday evening. Across town, hundreds stood outside Westminster in Parliament Square waving the blue and yellow flag of the EU while touting signs that read "Yes 2 EU" on Friday and Saturday. In Edinburgh, demonstrators protesting the anti-immigration rhetoric of the Leave campaign chanted, "Migrants are welcome here," as they marched down Royal Mile on Friday carrying banners declaring "solidarity with migrants" in the city's Old Town district. In Glasgow, more than 300 gathered Friday in George Square to protest the results of the Brexit referendum and what they called the "xenophobic hyperbole" kicked up the Leave camp. A major protest in London's Trafalgar Square is being planned for Tuesday by a group called London Stays. "Regardless of the EU Referendum result, we stand alongside the people of Europe to show we are inclusive, open and patient to understanding how we can make the Leave decision into a positive one for all," organizers said in an event listing for the rally on Facebook. Roughly 35,000 people had RSVP'd to the rally via the social media platform. It's unclear how, or if, the anti-Brexit protests continuing to pop up throughout the United Kingdom will affect the results of Thursday's referendum, but a petition demanding a do-over vote has garnered more than 2 million signatures in roughly two days and is reportedly slated for discussion in the House of Commons.